Well, there&apos;s a first for everything. The world&apos;s first vegan Oktoberfest will be coming to Santa Monica on October 4, so get your lederhosen and beer steins ready. 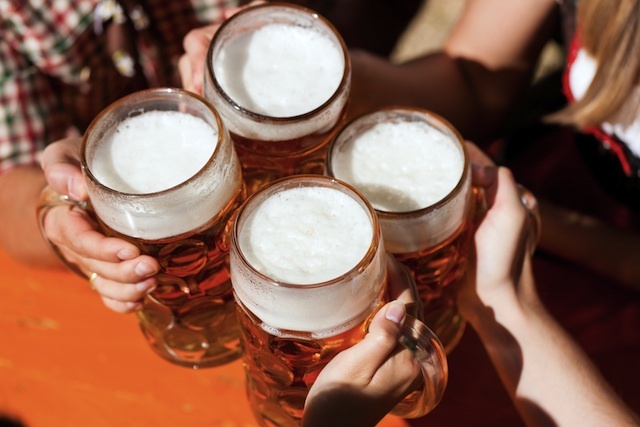 Vegan Oktoberfest won&apos;t be too different from your average Bavarian celebration—there will be live traditional German music, stein-holding contests, Bavarian maidens, and oompah bands; however, the twist is that you&apos;ll be getting a sweet selection of vegan craft beer and dishes. And it&apos;ll be held in a shaded area with picnic tables and views of the ocean. Although most beer is vegan, there are some breweries that use animal products in the process of making the brews. The fest will have breweries like Hangar 24, Golden Road Brewing, Modern Times, Drakes Brewing, Saint Archer and more pouring their vegan beers. There will even be ACE Cider for those folks who are on a gluten-free diet. And the food vendors like Sage Organic Vegan Bistro and Southern Fried Vegan will be whipping up vegan German treats like potato pancakes, beer brats, and German-style pretzels. L.A. food truck staples like the Grilled Cheese Truck, Dogtown Dogs and Green Truck will be creating their own plant-based meals for the masses as well. A general admission ticket is $45, which gets you a beer stein and unlimited beer from 1 p.m. to 6 p.m. A VIP ticket costs $65 and gets you in an hour earlier from noon to 6 p.m. The event will be held at 2600 Barnard Way in Santa Monica. For more information, visit their website here.